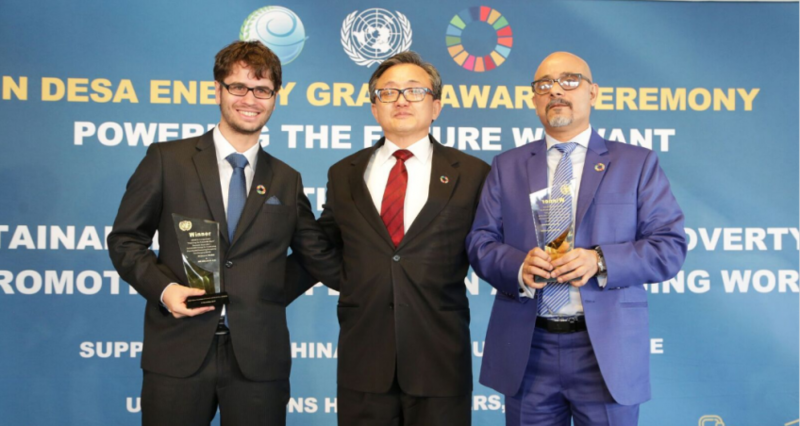 Two companies in Bangladesh received the UN DESA US $1 million 2017 UN Energy grant at the United Nations Headquarters in New York today in recognition of a novel project to spur solar entrepreneurship. The two companies, Grameen Shakti and ME SOLshare, received the grant for their joint project that will allow villagers to secure more solar power, save money through flexible energy access, and generate income from trading electricity. The project’s bottom-up mini grids seek to transform solar home systems into an income-generating asset. Its approach leverages existing resources to create a platform fueled by solar with numerous business opportunities for the villagers and with potential for replication throughout Bangladesh and under-electrified regions across the rest of the world. The partnership estimates that the grant money will enable them to establish a minimum of 100 smart grids resulting in at least 15,000 beneficiaries. But the impact of the grant is going to be greater, as it is likely to inspire more such initiatives. “Grameen Shakti and SOLshare are deeply honored that our innovative idea of creating a countrywide platform where villagers can share their solar electricity among each other and become smart entrepreneurs has been selected as the winner of the 2017 Powering the Future We Want Grant Challenge by UN DESA,” the winning partnership said in a statement.